← You’ve got product. You’ve got a facility. Do you have a walk-in store? Today’s topic: Is Kevin a liar? Or is setting up the Fishbowl Point-of-Sale (SalesPoint) easy? Last week I posted about a walk-in store or, more accurately, the LACK of one when there should have been one. I had visited a small chocolate factory that didn’t have a Point-of-Sale system and my point was, if you’ve got a product that people want to buy, and a location they want to visit, why not set one up and sell more product? I made it sound like well, duh, this is easy, why doesn’t everyone do it! But, as I thought about it later, I realized I had NEVER set up a Point-of-Sale before, so who am I to make judgments on whether or not it’s easy? So I went to Kevin Batchelor, our Head of Development, and asked him if it was easy to set up a Point-of-Sale. He said yes. (We can talk later about the wisdom of asking the Head of Development if setting up a particular piece of technical hardware/software is easy or not but, for now, I will take him at his word). 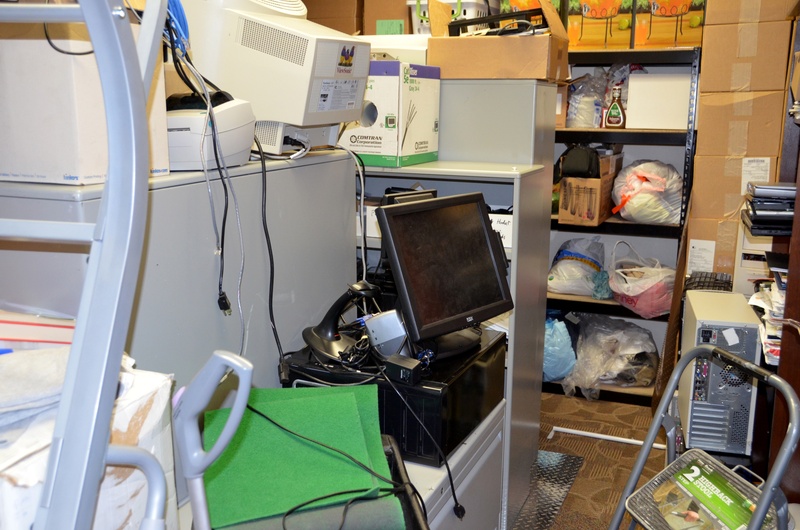 In fact, he said, I can go dig our Touchscreen POS Kit hardware out of the junk room (AKA The Fishbowl Room-of-Requirement) and try it out for myself. It’s that black computer-looking thing in the middle. The main monitor you see here is the Touchscreen/computer monitor for the POS with attached credit card reader (that’s the little part that sticks out on the side). It’s actually a small desktop computer that uses a Touchscreen as the monitor and has a credit card reader attached to the monitor on the right side. (Like any desktop computer, it comes with a keyboard and mouse). When the system is being used as a Point-of-Sale system (as intended), the user creates the Sales Order on the touchscreen and makes sure everything is correct before taking payment via the credit card reader or cash drawer. The transaction will appear on the Optional LCD Customer Display , which is the small display screen you see attached to the back side of the touchscreen and facing towards the customer. It’s just like those customer displays you see at your local Walmart. Cash Drawer: It’s a black metal box with a cash drawer inside that slides out when you need to accept cash or provide change. Receipt Printer: A simple straightforward receipt printer. It’s connected directly to the Point-of-Sale Screen/computer via cable. It also has a cable that connects from the printer to the cash drawer to tell the drawer when to open up. 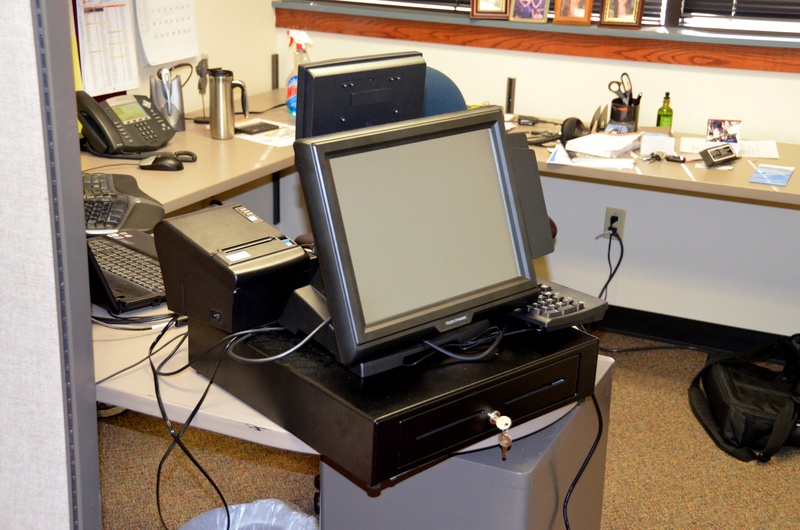 Scanner: A simple “wedge” type scanner that attaches via a cable directly to the POS Screen/computer. Frankly, I just hooked these up the way I thought they should go. I mean, there are only so many cables and connections, so I gave it my best shot and hooked them up. It seemed rather simple, which usually means I missed something. This was a little more challenging, not because of the software, but because of our network connections (or lack thereof). In order for SalesPoint to work, it has to be able to communicate with your Fishbowl database, which I am currently running on my local computer. But I only have one connection to our network (I’m in a building that’s a bit on the older side), and the Point of Sale hardware does not have a wireless connection. So I set my computer up to go wireless and gave my regular network connection to the Point-of-Sale computer. The Point-of-Sale was then able to download a trial copy of SalesPoint from our website (Yes, you only need to download SalesPoint, not Fishbowl). SalesPoint then needs to be told where to find the Fishbowl database. For me, this was the IP address for my laptop computer that was running a trial copy of Fishbowl. When I logged in to SalesPoint I was able to scroll down through the IP addresses of all the copies of Fishbowl currently connected to our network (either via cable, or wireless as mine was) but couldn’t find mine. So I asked one of our tech guys for help. (If you’ve seen “Who Wants to be a Millionaire”, that was my “Lifeline”). Apparently, my IP address was fairly long and so the entire address didn’t show up on the screen. I just had to scroll over to see it all. 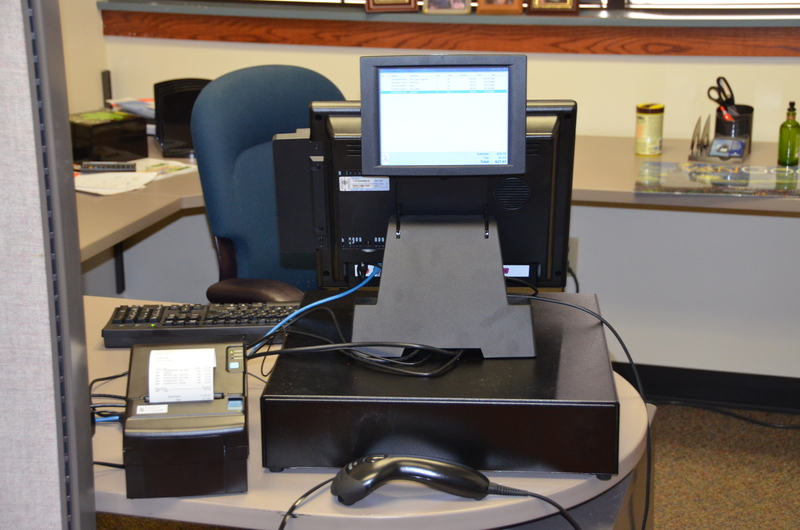 Running Point of Sale: Hardware hooked up, software installed. Let’s give it a shot! If you’re anything like me, the second you get your latest techno-toy even partially hooked up, you HAVE to turn it on and see if it’s working, period. No waiting around, no more reading manuals (they’re all evil anyway). I just want to see the thing work. So I grabbed the first thing I could find with a barcode on it (a can of fishfood) and scanned it in. Drum roll please….. It worked! The barcode had just been read in and SalesPoint was now asking me what the item was (which made sense since my sample database didn’t have any fishfood in it). So, I typed in the name, description, quantity on hand, how much it cost and how much I was selling it for. Once that was done, the item showed up on my screen. As a test, I scanned it again to see what would happen. This time it simply increased the quantity of fishfood cans on the order to 2 and calculated the total cost, which is exactly what I expected. I then scanned in three other items to see how it would work. Again, no problem. Finally, I finished the order, touched Check-out, (remember this IS a Touchscreen), paid with cash, and as soon as the order was complete, the cash drawer opened up and the printer printed the receipt. Here’s the picture to prove it. Perfect! About two hours with the network hassle, maybe an hour without it. Kevin, I’ll never doubt you again. PS Thanks to Kirk for taking the pictures! This entry was posted in Business Consulting, QuickBooks Consulting and tagged Inventory Management Software, Inventory software, Point-of-Sale. Bookmark the permalink. 1 Response to Today’s topic: Is Kevin a liar? Or is setting up the Fishbowl Point-of-Sale (SalesPoint) easy?